not one stranger believed in us, once upon a time, where would we all be today?... someone did it for you." Yes. Yes they did. So I Googled Zanele, found a link indicating she was who she said she was, and agreed to meet. And as I discovered, so did several other media professionals whom Zanele had e-mailed cold. In this challenging job market, I think it's worthwhile to explore why these busy professionals took the time to respond and help Zanele. I contacted a few of them to find out, and have come away with some ideas that might help other people looking for work — and not just those entering the workforce for the first time. Before she e-mailed anyone, Zanele sat down and wrote an outline for herself, articulating her several goals: to become a talk show host, establish a women's empowerment organization, become an author — and maybe become a plus-size fashion model as well. While these are crazily ambitious and at first glance unrealistically expansive goals for a college student, two unifying themes — to work in the media and be a catalyst for helping other women — helped her target her search. Zanele's focus on media professions (she wasn't exploring legal or financial positions, for instance) allowed her to channel her search towards those operations (Oprah Winfrey Network, Oxygen Network, Essence, Ebony, YWCA) whose missions seemed to align with her dreams. "It was important for me to truly believe in what they do," she told me, "in order for my letter to have truth." Like any modern day sleuth, she used every tool to find the right contacts, web-searching terms such as "corporate women authors," "women in magazines," scouring sites like LinkedIn, company websites, Twitter, and executive profiles. Since most companies have standard e-mail formats, she sent multiple emails in every conceivable format until she didn't get a "mail delivery error." Within her relatively narrowcast objective, she contacted as many people as possible — eventually writing to 2,000 people. Thirty responded to those e-mails and six agreed to meet with her in person. With that kind of a response rate, the benefits of going wide are obvious. Dina Gusovsky, a broadcast journalist and columnist, was one of the media professionals who responded. While most people would think that being as brief and to the point in their cover note as possible would be the most professional and likely to succeed approach, Dina's response indicates that the opposite may true. She told me that she agreed to meet with Zanele "because I think at one point we were all Zaneles. Sometimes I feel like I still am. For creative people...the journey never ends. Whatever success I have had so far is directly correlated to all the people who gave me a chance. Not just those who decided to put me on television, but those who listened, those who gave me advice, and those who mentored me." But as an emigre from the Soviet Union, for Dina it was Zanele's immigrant background that resonated most. Her meeting with Zanele was "probably less pay-it-forward and more pay-it-backward. I think all those people who had helped me and continue to help would be proud that I was in some way continuing this wonderful trend." Janice Huff, the chief meteorologist for WNBC TV in New York, responds to lots of inquiries from young people interested in becoming meteorologists, but rarely takes the extra step to meet with them. However, Zanele had susssed out that Janice was a fellow Alpha Kappa Alpha sorority sister, and personalized her note referencing that shared connection. For Janice, "that's what made me decide I'd love to meet her and help her." Zanele took the time to find shared interests for about 20% of her targets and mentioned them in her notes. So before you reach out it pays to research, and determine where your connection points might lie. Ellianna Placas, a fashion consultant and another immigrant (from Australia), and the former Fashion Director for Essence Magazine, was impressed by Zanele's ability to "show honesty and vulnerability and risk, putting her faith in human nature first — a brave and open beginning. 'Believe in a stranger' was so romantic, yet realistically appealing to me. Maybe I am imbuing it with more than Zanele intended, but it held universal appeal. We should all be helping each other. Zanele came to me for advice, she left as a new friend." After several people in New York City had responded to her letter, Zanele decided she had reason enough to make the trip from Portland. And while she did not leave New York with a firm job offer, she will be returning to follow up on the leads developed in her first round of conversations. "I learned so much about myself and exactly what makes me tick," Zanele told me after her trip. "I believe it is so important to know or hold a conversation with people who have career positions you aspire to have someday. The value of relationships and conversation is incredibly important to me. Those conversations will not magically appear on my phone and g-mail, I have to go and get them. No, not everyone will respond and not everyone 'needs' to — only the people who are meant to." Ellianna Placas put it best: "No one knows how we arrive in the places or jobs we do. We did not do it by ourselves, we were surrounded by people along the way who gave tiny bits of advice, who we watched, who helped us make and not make choices." That's something we should all keep in mind, especially as we make the upward and sideways journeys in our own careers. To paraphrase Sir Isaac Newton, at some point in our lives we have all stood on the shoulders of (seemingly gigantic) strangers, and there comes a time when we need to give others the chance to stand on ours. the international interconnected marketplace, we at Children's Television Workshop (CTW), as it was known then, pioneered the development of a flexible global brand. Our approach to programming was to maintain the values, look and feel of the parent company and its main product, Sesame Street — carefully crafted live-action and animation and puppetry segments, woven together with a curriculum designed by educators, writers, producers and artists to help pre-school kids learn basic cognitive skills, to appreciate cultural diversity, and to achieve broader goals, like learning how to handle conflict. At the same time, we wanted to enable our co-producing partners to work with local educators, writers, and producers to craft the specific early childhood educational goals unique to their own countries. For example, in those early co-productions, the North American urban street of the original series was replaced by a plaza in Latin America, a strassa in Germany, or a rue in France. And those international stageset streets were populated by original puppet characters — parrots, hedgehogs, bears, and camels characteristic of the region and created by local producers. Identifying The Country-Specific Critical Needs First "According to the McKinsey Global Institute's "bird of gold" index, India is entering a period of sustained, but unequal, economic growth with 161.1 million (or 67% of its population) gaining access to mass media. That leaves 33% of the country with limited access to mass media and educational opportunities. And while school enrollment is at an all-time high, UNICEF has reported that the educational system is "inadequately developed." "The scale of this underserved market, coupled with Sesame Workshop's 40 years of expertise in partnering with local educational and programming experts, created an important opportunity," said, Rosenfeld, "for us to meet critical needs on an unprecedented scale, while at the same time building toward a future that would allow our work in India to be financially sustainable." Being Willing To Try New Operating Models According to Rosenfeld, "unlike most of the other markets in which we co-produce, Sesame Streethad never been broadcast in India. The fact that our audience had zero prior exposure to the brand created both a challenge and an opportunity. The challenge was that we couldn't trade on our global brand equity and iconic characters; at the same time, the lack of familiarity with the brand gave us greater latitude in creating a local interpretation of the Sesame experiences. That, combined with the enormous potential for large-scale impact, was a key driver in thinking through a new operational model in India. As always, we built a strong coalition of partners including broadcasters, educators, production companies, foundations, and corporations, but rather than manage the operation from New York, we decided to embark on a new path that would evolve our approach from 'project management' to 'social entrepreneurship,' by building a new 30-person organization from the ground up." Embracing New And Multiple Means Of Distribution The limited access to broadcast technology (among the targeted 33% underserved target population) has spurred the Galli Galli Sim Sim team to learn from the market, improving and evolving content to maximize distribution. Rosenfeld says they've piloted the delivery of content through mobile phones, including teacher-training videos which are on pre-loaded sim cards. SWI has created community radio with call in from parents and educators, and "Radiophone," which delivers radio episodes via mobile phones. Outreach materials in 9 local languages on topics as diverse as health, nutrition, financial literacy and school readiness have been distributed to millions of children throughout India. And more than 200 television episodes have been broadcast on India's national broadcaster, Doordarshan, and on Pogo and Cartoon Channel, India's destination channels for young kids. Propagating Lessons Learned Internally The Sesame Workshop India (SWI) enterprise has created a hub for the exchange of ideas and expertise for the region. Rosenfeld describes how members of the Afghanistan and Indonesian teams have attended content and production workshops conducted by the Galli Galli Sim Sim team in conjunction with select personnel from Sesame in New York. "Sesame Workshop India's outreach team has worked on location in Nigeria and Indonesia, supporting local efforts to develop outreach initiatives and explore new business models; having our partners recognize the value of each other's expertise and share their original content keeps all of us more nimble and engaged," she says. The benefit of this shared learning is invaluable across all of their efforts — encouraging a kind of permeable membrane of growth and innovation throughout the entire organization — domestic and international. Taking The Long View "With SWI, Rosenfeld adds, "Sesame Workshop has extended the horizon line for success by creating long-term development plans that are building toward a base of diversified revenue sources, forging mass distribution through government-run preschools and cultivating a culture of innovation that pilots new content that reaches children across socio-economic and the urban/rural divide. The entrepreneurial spirit that characterizes SWI is born from the latitude to develop new enterprises, like launching a pre-school [classroom] business through a new franchise model, that will not only deliver on core educational objectives, but will also serve as a critical revenue stream necessary to cross-subsidize other work." The creators and distributors of Sesame Street were successfully pursuing an aggressive global strategy 30 years ago, before "globalization" was a common concept or phrase in America. It has done so by being clear and steadfast about its essential brand values while also seeking to understand deeply and flexibly adapt to local conditions and norms. It is an important model for 21st century companies as they seek to be relevant in an international marketplace, where being a successful American brand is not in and of itself a guarantee of global success. Nothing makes people preemptively yawn more than hearing a show about 'balancing professional and personal life'. Also, so many shows that tell women-centric stories sacrifice edginess and comedy for softness, and viewers get bored of that. But there is a reason why these stories keep getting told — because they are relatable. My strategy for a fresh take is simple: write honest and original observations about something that I am going through. My character is impulsive, opinionated, and outspoken. She gets to do and say things on the show that I wish I could, but don't have the nerve to do. (I think smartly-executed wish-fulfillment is a great form of entertainment.) That comes from a kind of innate confidence that gets her into trouble, but is also very admirable. I hope people watching envy Mindy's confidence. I chose to make my character an OB/GYN because I grew up with a mother who was an OB/GYN, which was essentially 33 years of research on the ins and outs of the lifestyle of an incredibly busy professional. Workplaces are a great thing to write about because even with our high unemployment rate, a whopping majority of people go to work everyday and have funny stories to tell about it. You wouldn't think that being an OB/GYN has much in common with being a network show-runner, but there are plenty of similarities between my work life and my character's work life. For instance, while my mother and I had very different jobs, our professional lifestyles have been very similar. I could call her from L.A. at 11 PM PST and she would be at the hospital in Boston waiting for a patient to give birth at 2 AM EST. Both jobs paid well and didn't give either of us very much free time, but we loved them. Neither is the kind of job you can do unless you really, really love it. Twitter is helpful, not so much for people sharing stories about their jobs, but for feedback — both positive and negative — about story lines they love. People use Twitter to quote lines they love, so it's the single easiest way to identify the funniest lines of a show. At the risk of sounding like Michael Scott, I think I am a pretty damn good boss. I was a little worried about it at the beginning, because my inclination is to want everyone to like me. That always seems to get me into trouble, because I make promises I can't keep just to please everyone. But now there is simply no time for any of that. Because I am doing so much more on this show than at The Office, I have learned a cheerfully direct way of talking. I'm incredibly impatient, and while that's been a detriment in the past, it's an advantage as a boss, because it keeps things moving quickly. 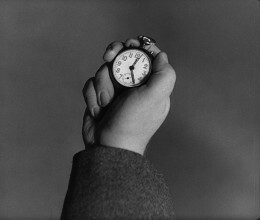 I recommend it to any leader: be impatient. By quickly and nicely shutting down lines of argument, and being decisive, I save the entire production hours and hours of work and money. One thing I have noticed — and this is really the first time I've noticed how being a woman has affected my job — is that sometimes, after I've made a decision about something, there's a level of discussion that people think I am willing to entertain that probably wouldn't happen if I were a man. I have learned that when I make a decision, sometimes I just need to leave the room. Follow the conversation at Harvard Business Review. "Coworking" office spaces, leasable by the day or month (think RocketSpace in San Francisco or The Hive in Denver) are multiplying in cities all over the country. Demand is predicted to expand by as much as 40% in 2013. And for good reason. It's no secret that the efficiency-driven modern office is a joyless and at best neutral venue in most people's lives. (Think: boxy cubicles that don't enable privacy or community, lack of natural light, incoherent design, etc.) And experiments to improve office spaces are nothing new. From the "college campus" envisioned by legendary adman Jay Chiat, where employees came to the office to gather information and then work wherever they wanted within the building, to Steve Jobs' Pixar campus, fluid, open plans have been touted as environments that lead to greater collegiality and productivity. But the 21st century workforce, increasingly telecommuting and/or bouncing from job to job and city to city, is making those "modern" late-20th-century office concepts feel quaint. 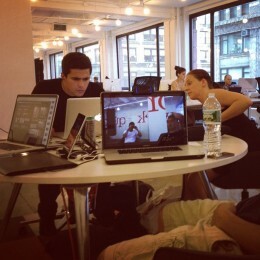 To better understand what's going on, I spent time at Grind in New York City, an invitation-only co-working space. For $35 a day or $500 a month, 60 to 120 people populate Grind's 7,500 square feet at any given time. Benjamin Dyett, one of Grind's three founders, describes their members as "free radicals," or people who "network endlessly and collaborate constantly. They choose when and how they do what they do, on their own terms. They don't want job security, they want career fluidity." It's a setup that clearly seems to be working for a growing number of people, and represents a cultural shift that is a corollary to (but extends beyond) the out-sourcing and employee churn of a top-down flexible labor force. Like cousins of the Chiat or Jobs workspaces, where full-time employees devote themselves to a single cult-like institution in groovy architecture that encourages playful collaboration, the new co-working spaces thrive on a constantly changing cast of characters — all with different skills, experience and business goals, where members are creating and running many different kinds of enterprises. While getting out of the house to work for free in the quasi-community of a coffee shop might feel like a no-strings, easily-accessible kind of co-working environment, don't be fooled. Free wifi places are fine as social gathering spots, but the random non-working others who share that space surely won't help you find new colleagues or generate development leads. Spanish-born Roberto Alcazar, who started his branded content agency EOIntegration.com at Grind at the end of 2011, told me one of the things he likes about Grind, "is that you get to interact whether you want to or not. There are lots of people with different backgrounds and disciplines and it keeps you up to speed and up to date. A five-minute chat with that investor or that start-up guy can prove to be invaluable." Former banker Hans Reichstetter, who runs three very different businesses in various stages of development out of Grind, sparkled when describing the huge diversity of people doing all sorts of things: freelancers, creatives, lawyers, entrepreneurs, accountants, coders — you see it all. "I needed an industrial designer who knew CAD and there was a guy here who knew it really well." And the fact that one's workplace neighbors are not official colleagues can have an upside in the lack of competitive game-playing and back-stabbing. By attracting a variety of members from myriad backgrounds and industries, the looser connections of these constantly churning spaces also appear to have innovation advantages. Martin Ruef, a sociologist at Princeton who's studied entrepreneurs, found that those who broadened their universe of contacts from small groups of familiar acquaintances to larger, more loosely-connected networks of people were far more innovative. As another of Grind's founders, Stuart Warshaw, says, "Grind is a case study in collaboration across many disciplines and among established professionals." 3. They make starting a business simpler. Former CNN.com sports executive Leora Blumberg, who is part of a Grind-based start-up called Personalized Media, says that the company found its way to Grind because they work on projects on an ad hoc basis with people in Europe and Washington, and they required the flexibility of operating from a place suited to a highly variable daily head count. Tom Chernaik, a lawyer running CMP.ly, a company that offers a transparent way to disclose legal terms within the social media context, thought his time at Grind was going to be temporary, but he sees no reason yet to give up the benefits of ultra-flexibility and low overhead. "With seven employees, we're at the tipping point," he says, "where it might be cheaper to get dedicated office space, but even if we do, I'll keep a daily membership here so we have access to the community." If you're interested in working from a collaborative workspace, explore the various options in your city. Visit a few on day passes to see which has the best vibe and infrastructure for you. The pricing varies from place to place — ranging from $150/month to $600/month and $15/day to $50/day. There are also a whole range of sector-specific spaces, specialized for tech, creative, food, or educational professionals. It's just one of the many ways that companies are capitalizing on flexible workspaces for a flexible workforce — a trend we can all expect to see more of in the future. When Emma Cookson, the Chairman of the New York branch of Bartle Bogle Hegarty (BBH), an award-winning ad agency, and her team concocted an innovative marketing program called Homeless Hotspots, they genuinely had no sense of the furor that they'd be facing when the project launched.The Homeless Hotspots program was meant to serve the needs of the super digerati who attend the South by Southwest (SXSW) conference in Austin, Texas. 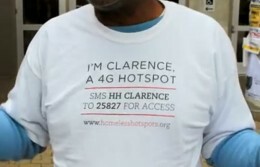 Inspired by the established model of homeless people earning money by selling homelessness-focused newspapers, BBH's idea was for homeless people, wearing T-shirts printed with their names and identifying themselves as 4G hotspots, to sell connectivity (an issue for conference attendees) by means of small handheld Wi-Fi routers. Bad early-March weather kept the program mostly invisible until the third day of SXSW, when appalled commentary began to roil the Twitterverse. Cookson found herself in the unexpected position of having to react to a media tsunami — fast. As Cookson was putting her kids to bed the evening of Sunday, March 11 in her Brooklyn home, her Tweetdeck started "blinking very loudly," with her team on the ground in Austin alerting her that something alarming was going on. Individuals had begun negative tweets about Hotspots that cascaded into a cycle of news stories (See articles from ReadWriteWeb, The New York Times and Wired) and what started out as a small brush fire suddenly scaled up to a full-blown firestorm. The speed at which it all happened was unprecedented, given that it was generated by the tech community gathered at SXSW, and not some other big gathering. With the event now solidly in her rearview mirror, what does Cookson understand about the situation that she didn't know at the time? "I don't think I realized how large the volume of comments without information could be," she says. "The overall effect during the first 24 hours was a very big and very noisy, but largely empty echo chamber. Most of the initial commentary got all of the facts wrong. Nobody knew that all the money (a daily minimum of $50 for up to six hours of work) was going to the participants themselves, nobody knew there was no sponsor or brand connected to the program, nobody knew how the participants felt — there were a number of pieces of missing information." On Monday morning, Cookson was looking at a voluminous and overwhelmingly negative set of public comments. "Obviously, the big question for us," Cookson says, "was how do you face that first storm? Do you just stop, exit and apologize? Or, do you carry on and try to explain? We had to make that call really early on — and it's a big call, because once you act on the decision, you can't go back. We decided that we needed to address the comments head-on." "The reason why I chose to continue," she says, "is because we thought there was a new perspective to bring to bear." Cookson knew, for instance, that nobody had actually heard from the homeless participants whose voices were going to be credible and powerful. Participants like Clarence Jones, a 54-year-old homeless survivor of Hurricane Katrina, or Jonathan Hill II, who reported that he liked being a hotspot better than "his usual work doing manual labor at music venues, largely because it offered him a chance to talk to some of the thousands of the attendees at the program, who normally ignore the roughly 6,000-strong homeless population in Austin." Cookson describes a clear trajectory in the coverage and believes that, unlike some big corporation with a crisis management team, BBH's decision to talk to everyone proved helpful, finding "that in one-on-one conversations, people were almost always positive." She adds, "What started off on Sunday as primarily negative was by Tuesday hotly debated with new pieces like those on The Atlantic Wire or NPR's Talk of the Nation, where the majority of the call-in comments during the show were supportive and recognized the delicate tension between empowerment and exploitation. It was still a controversial story, but much more balanced. I'd say we made the right decision." Cookson says they made a deliberate decision in the planning stages of Homeless Hotspots that they needed to make the fact that the participants were homeless apparent upfront in the name — thus, Homeless Hotspots. "But," she says, "it's not a surprise to someone who works in advertising that what people respond to is not just what you say but how you say it. I work in the communications industry — the execution, the style and the expression are a vast part of what people respond to. The T-shirt message was received very differently when stripped from its original context and broadcast as tweets." One of Cookson's big lessons was in experiencing the value of her corporate culture through the prism of a crisis. There was a small team of people involved, but she was the decision-maker. "While I was facing an extremely high-volume challenge and criticism externally, I realized after a while that I wasn't facing criticism internally. When the story went big on Sunday night, I e-mailed the global leadership to tell them what was happening and what we were doing about it, but then, I was pretty much left to manage it. What I didn't have — that I think many companies would have had — was any internal challenging or questioning of my judgment." Cookson says that not having to deal with that bureaucratic operational complexity was really critical, because it was a very fast-moving situation. "If' I'd had to keep reporting back, it would have been disabling, and it would have been further disabling if I'd been distracted by a worry that I or my team was being judged internally. We talk about needing to embrace risk to do fresh, innovative stuff," she says, "and this was a living embodiment. Lots of companies talk about embracing risk but don't mean it. How we reacted was a validation that we meant it." What Would You Do Differently Knowing What You Know Now? Cookson says she still finds it hard to answer the question of whether she would do anything differently in hindsight, and has thought a lot about how controversy drove the story. Businesses generally don't like controversy, but to Cookson, Homeless Hotspots proved that controversy has enormous power — driving the comments, the outrage, and the conversation. 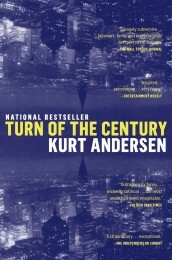 "If you ever need to get a message through, controversy cuts through like nothing else." Then, of course, you have to judge the costs and benefits, deciding whether you want to endure the downside in order to get the upside.